We get into a long list of national news issues including the wall along the southern border, President Trump, immigration policy and the federal government shutdown. We spent time discussing Alexandria Ocasio-Cortez, Pay-Go, the Green New Deal, Medicare-for-All and much more. The border wall is political theater. Trump is playing his base. The $5 billion spending plan is 1/1000th of the federal budget but only covers approximately 200 miles of the nearly 2000 miles of the southern border. The purpose of this issue is to divide the nation, fire up his base and serve as a distraction to far larger problems facing the Trump Administration. Illegal immigration is a low priority problem relative to wars, $22 trillion federal debt, $1 trillion deficit, structural deficits in Medicare and Social Security, foreign nations, corporate welfare, incarceration state, surveillance state and more. How do we solve this problem? America was founded on the basis of Inalienable rights of life, liberty and the pursuit of happiness. The wall represents the opposite of these rights. The wall is the opposite of freedom, by definition. The wall is a symbol of the failure of America’s immigration policy. The solution is to expand legal immigration. 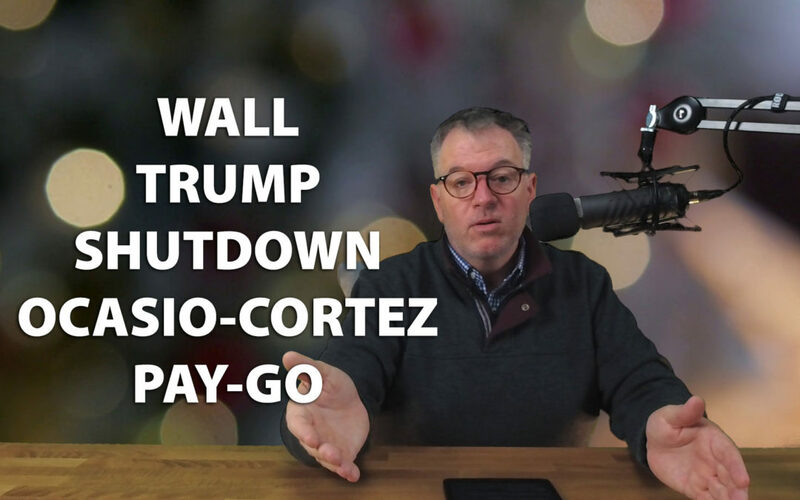 I explain this in more detail in this podcast as well as get into issues with the government shutdown, how the government shutdown is not a shutdown, national parks, hypocrisy by both Republicans and Democrats, the Washington Monument Syndrome, Alexandria Ocasio-Cortez, her objection to Pay-Go, immorality of adding more debt, her proposal for a 70% top marginal tax rate, Green New Deal, Medicare-for-All, Republicans falling into trap of mocking AOC, GOP failure to engage in a battle of ideas on moral grounds, the importance of wedge issues and the similarities of the two parties.